An expression is derived that relates the frequency of ring capillary and gravitational waves on the surface of the conducting liquid in an external uniform electrostatic field to the physical parameters and an analog of the wavenumber. It is shown that the obtained expression formally has the same appearance as the dispersion equation for plane waves; however, in the case under study, the wavenumber as a characteristic of ring waves has no sense due to the undefined concept of wavelength. 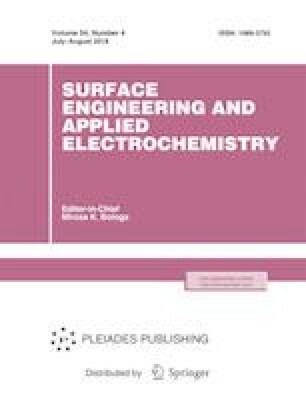 The paper considers the possibility of attaining an electric discharge from the surface of the liquid charged in the external electrostatic field, when drops of the same liquid are falling on it. Original Russian Text © S.O. Shiryaeva, A.I. Grigor’ev, K.I. Orlova, 2018, published in Elektronnaya Obrabotka Materialov, 2018, No. 1, pp. 41–45.